I don't typically like these older books, with poetry and their weird talk, but this one was pretty good. 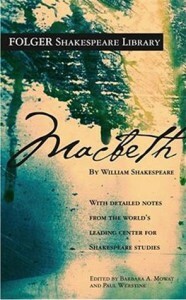 Macbeth killed some people, then killed a bunch more. Lady Macbeth was like 'whoooo let's go kill the king' but then she starts to feel guilty while Macbeth feels less guilty. The witches were awesome. "Double, Double. toil and trouble. Fire burn and cauldron bubble'! Pretty intense stuff. Kind of hilarious how they tricked him and how Macbeth was so easily defeated.